Flax seeds are small glossy seeds that contain an omega-3 fatty acid known as linolenic acid (LNA). It is thought the LNA content in flax seeds slow the development of some cancers as well as increase the effectiveness of chemotherapy medication. It does this by decreasing the inflammatory compounds that favor cancer development and suppress the immune system. In addition, LNA is thought to have a direct action on cancer cells, stopping their inability for apoptosis and ability for angiogenesis. Flax seeds also serves as a leading source of lignans, phytoestrogens that influence the balance of estrogens in the body and help protect against breast cancer. An easy way to get flax seeds into your diet is by grinding a tablespoon in a coffee grinder or a mini food processor and adding it to cereal, oatmeal, or yogurt. Grinding the flax seeds is necessary otherwise the nutrients would be difficult for the body to absorb. 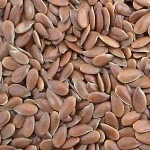 Do not heat the flax seeds because that will destroy the anti-cancer benefits. The omega-3 consumption that is derived from flax seeds is better complemented when omega-6 consumption is decreased. Omega-6 containing foods are present in meat, eggs, and various vegetable oils. As usually is the case, supplements are not recommended; eating whole food forms are the best way to reap the benefits.